I got my Stash Tea when it was 2 boxes for $5. Each box of Earl Grey contains 20 tea bags, which works out to be 1.9g of tea per tea bag which isn’t bad at all. The box for the Stash Tea Company’s Earl Grey makes me smile. It’s a very simple card stock box with two perforated openings to choose from. I opted for the opening at the bottom, so I can sit the box upright and the tea is accessible out the bottom. The other way to open it is to use your finger to punch in the side, and one whole side of the box lifts up (and can be tucked back in. Stash Teas come in individually packaged tea bags. For those that love loose leaf teas, you may be frowning at me right now but that’s okay. Tea bags can be useful! Especially if you’re travelling and don’t want to deal with spoons and infusers – or if you don’t want to make up your own tea bags with filters. The foil wrapper for the tea bags are a nice touch. While it does result in more waste, it does keep the tea bag in a sealed environment that protects it from air and light. There’s a handy cut at the top of the packaging which makes it easier to rip that sucker open. Almost instantaneously, I can smell the fragrant bergamot oil – one of my favourite parts of any good Earl Grey tea. 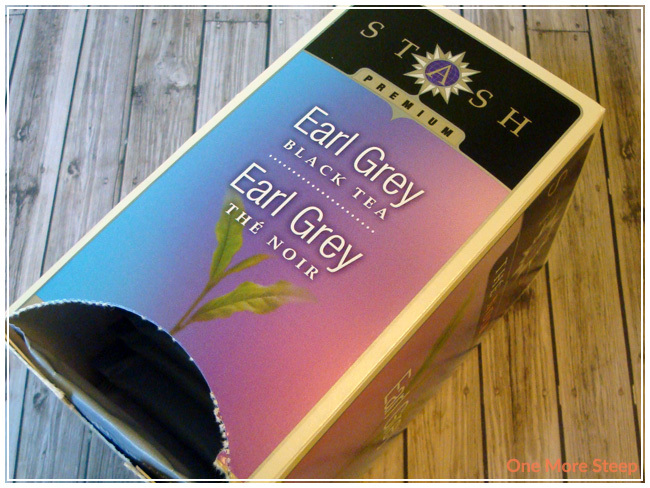 Stash Tea’s Earl Grey lists the following as ingredients: premium black teas with oil of bergamot. The bright citrus smell with the scent of the black tea makes me eager about what is coming up next. Each tea bag packaging has steeping instructions. Stash recommends 3-5 minutes with no information regarding water temperature. I opted for my usual just boiled water for black teas and I steeped for about 3-4 minutes. Not going to lie, this is not my first time trying Stash Tea’s Earl Grey. I actually received a lovely tea package from my friend Amanda who put together an amazing sampler pack for me of Stash Teas from the shop she works in, the Country General Store. The first tea that I tried and finished from the package was the Earl Grey. I fell in love with it the first time I tried it, it was a magical moment. Stash Tea’s Earl Grey smells more like black tea than bergamot oil when it’s steeping and it is a lovely reddish brown colour. It is a very pleasant black tea base with some nice almost floral notes to the tea, the bergamot taste isn’t overwhelming on first sip. It’s a very comforting and familiar taste for me since I do love Earl Grey. I find that adding sugar or honey to sweeten the tea helps brighten the bergamot flavour a smidgen and makes it a winning tea for me. It is not a particularly strong black tea, but it does have very good flavour which is always what I’m looking for in an Earl Grey. The bergamot is more noticeable with the addition of a sweetener, so that is something to take into consideration. I like this on both with and without the addition of milk or cream, so if you’re looking for an Earl Grey that would work well in a London Fog you might want to consider this one. If I was using this Earl Grey for a pot, I would probably consider using two tea bags or more, just because it is only 1.9g of tea per bag and you will probably find the Earl Grey on the weaker side if you were making a pot and only using one tea bag. On second steep (for a full 5 minute this time), it’s pretty good! It steeps to about the same deep reddish brown colour. It does fairly well on the second steep in terms of flavour holding true to the first cup. On the second go around, the Earl Grey does need a little bit more sugar than the first cup to bring out the bergamot flavour a bit more, a bit like it needs to be coaxed. 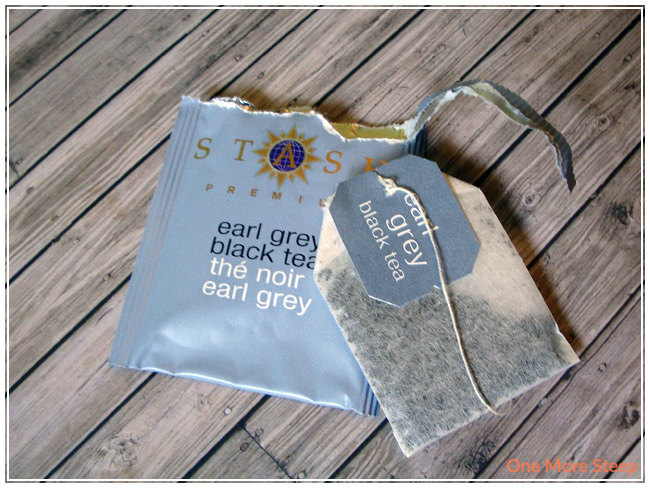 I loved Stash Tea Company’s Earl Grey. For the taste and the price, it’s well worth it at $0.13 per tea bag – especially with the added fact that it does resteep fairly well. I have great appreciation for simple and functional packaging. 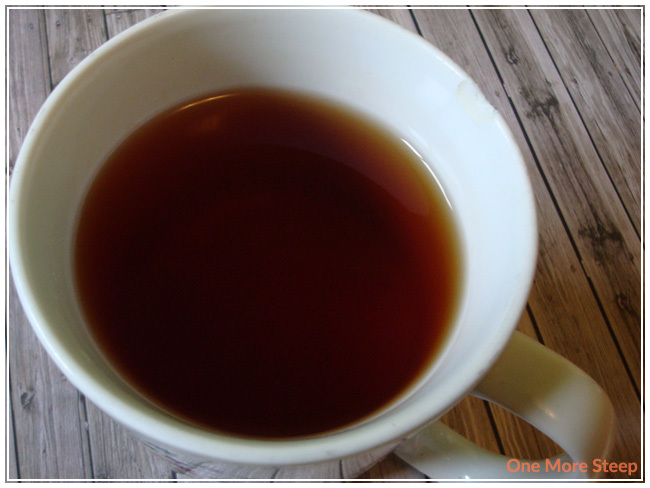 If you’re looking for a great everyday Earl Grey tea, this one may work for you. The bonus with it being prepackaged tea bags is that it travels well without you needing to scoop or use filters. For those that are die-hard loose leaf tea fans, I find this tea is very good (I’m a loose leaf tea fan too! ).